Sucralose, an artificial sweetener, is a good tracer of wastewater. It is present at low levels throughout the Puget Sound . Thousands of chemicals are used in consumer products and industry; however, many are not regulated and some may cause impacts. These chemicals are referred to as Contaminants of Emerging Concern (CECs). CECs include pharmaceuticals, personal care products, flame retardants, some pesticides, perfluorinated compounds (e.g., non-stick and stain resistant coatings), chlorinated paraffins (e.g., plasiticizers), and a variety of other compounds. CECs come from consumer products we all use, and from everyday activities. CECs generally enter surface waters through a variety of pathways including wastewater, biosolids, combined sewer overflows, storm water runoff, agricultural runoff, and septic systems. CECs are commonly detected in the environment. Some may cause harm at low exposure concentrations. Most of these chemicals are not new but their recent detection in the environment is largely due to improved measurement techniques. This factsheet provides an overview of recent regional research efforts to determine the range and potential impacts of CECs in the environment. Much of the work in the Puget Sound and Columbia River has focused on determining the concentration and distribution of CECs in the environment. 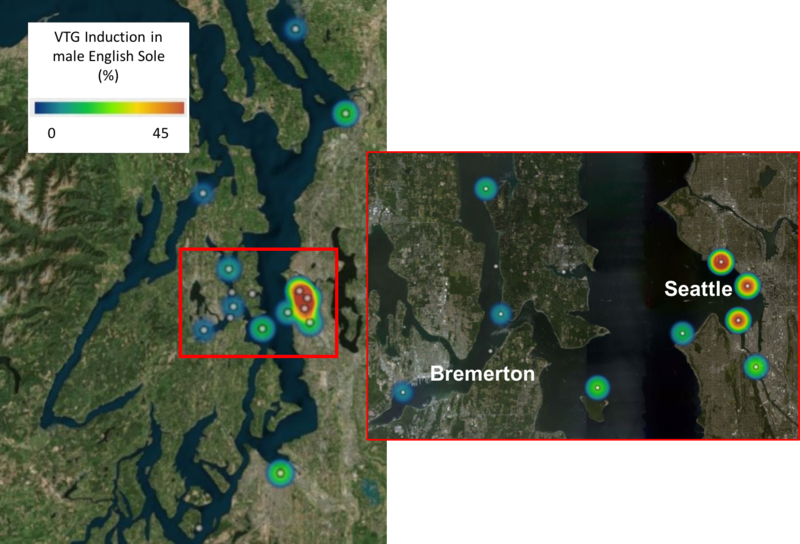 Recent water quality monitoring efforts have evaluated CECs in Puget Sound surface waters to determine when and where they occur . CECs were found at low levels in samples collected at over 40 locations, indicating their widespread presence; concentrations were generally higher in urban areas. Numerous wastewater treatment plants (WWTP) discharge treated effluent to the Columbia River and Puget Sound. Monitoring at WWTPs along the Columbia River detected over 110 CECs in wastewater effluent; many of these compounds were also found in WWTP effluent from elsewhere in Washington and Oregon [3,4]. Further tests on WWTP effluent found high levels of estrogenicity (it mimics the activity of female hormones) [3, 4]. Advanced treatment systems found in newer treatment plants can improve removal of some CECs . Samples from seeps and streams entering Puget Sound contained a wide variety of CECs indicating that septic systems are pathways of CECs to the environment . Analysis of sediment samples from Puget Sound and the Columbia River indicates CECs are common in sediments, particularly in urban areas . Common cold medications (diphenhydramine) and antibacterials from soaps (triclocarban) were found in many of the samples. These chemicals enters Puget Sound and the Columbia River through WWTPs after being consumed and excreted by people throughout the region. Many detected CECs are endocrine disruptors which affect the reproductive systems of animals. The level of vitellogenin (VTG) in fish can provide a measure of exposure to endocrine disruptors (hormones and other CECs). VTG is a protein necessary for egg formation in female fish; males and juveniles do not produce VTG. Therefore, the presence of VTG in males or juveniles indicates they have been exposed to estrogenic compounds. Juvenile Chinook that were migrating out to sea were collected from urban and nonurban areas in Puget Sound and tested for evidence of exposure to endocrine disruptors. VTG was found in juvenile fish at two urban sites, suggesting exposure had occurred, even at an early life stage . Similarly, a juvenile salmonid survey in the lower Columbia River found VTG in a significant number of fish, particularly near urban centers, indicating exposure to endocrine disrupters . 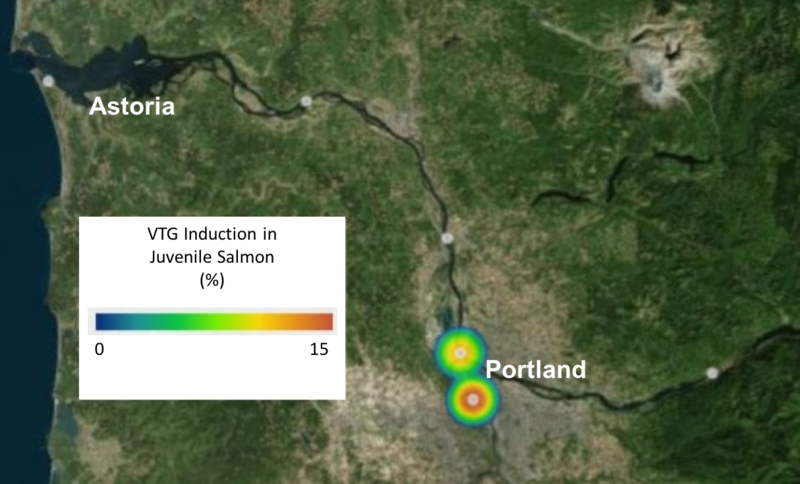 The percent of juvenile salmon at five locations in the Columbia River expressing vitellogenin (VTG), an indicator of exposure to endocrine disrupting compounds. Juvenile salmon do not normally produce VTG. Adapted from . 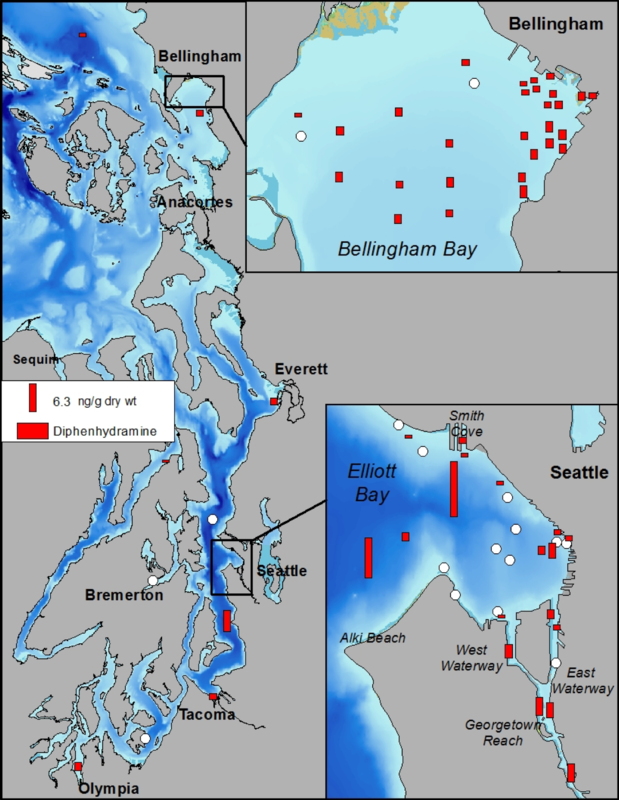 Abnormalities in Puget Sound bottom fish (English sole) were observed during the 1980s and 1990s, prompting investigations for evidence of endocrine disruption. VTG was detected in male English sole; highest occurrences were found in urban areas. At sites with high occurrence of VTG, spawning timing appeared altered, indicating that unknown estrogenic compounds may have impacted reproduction . Follow up studies found several endocrine disrupters, including bisphenol A (a compound used in some plastics) and 17-beta estradiol (a potent human hormone), in bile of English sole. The monitoring was performed utilizing advanced analytical techniques that were developed by researchers in the region . 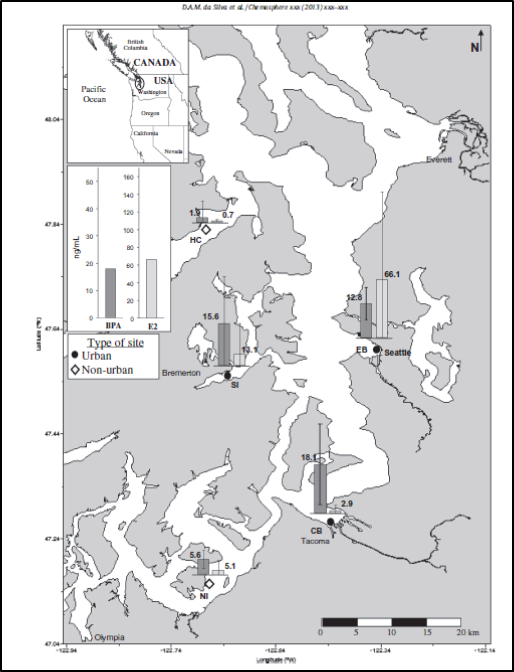 The mean concentration of bisphenol A (BPA) and 17-beta estradiol (E2) in the bile of male English sole in the Puget Sound. Both are endocrine disrupting compounds. Image from . Some CECs such as flame retardants (PBDEs) and perfluorinated compounds, which are commonly used to make material stain-resistant or non-stick, have been linked to adverse health outcomes in animals. Human biomonitoring studies conducted by Centers for Disease Control and Prevention indicate that there is widespread exposure to some commonly used industrial chemicals including PBDEs, bisphenol A, and perfluorinated compounds . VTG induction in male English sole near Seattle, WA. Monitoring English sole and salmon in Puget Sound to identify specific chemicals which may be causing harm to fish. Investigating the effects of CECs on marine organisms by focusing on biomarkers. Biomarkers are chemical and genetic signals that animals produce after being exposed to some chemicals. They can provide an indication of exposure and help understand how aquatic life might be impacted. While some modest efforts are underway to evaluate CECs, more resources are needed to address this problem. The Puget Sound Ecosystem Monitoring Program Toxics Workgroup has developed a prioritization process to focus CEC monitoring and research efforts. This process should be considered in developing future efforts to address CECs. 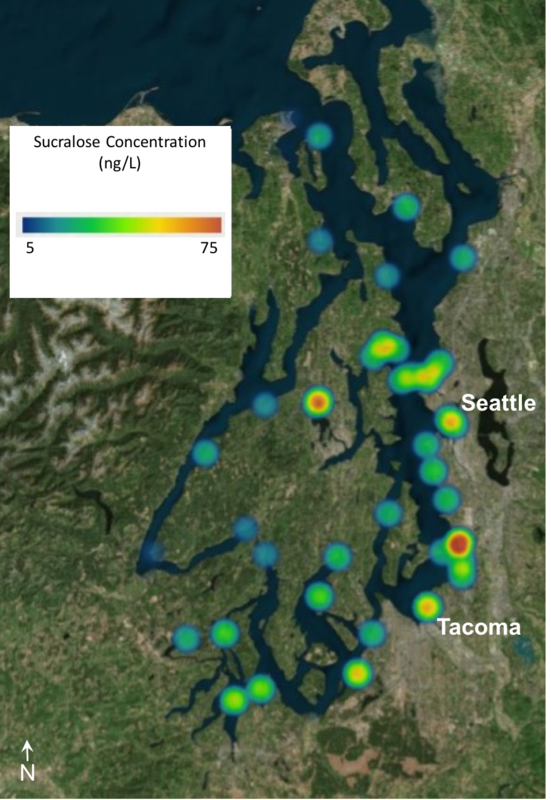 Long, E.R., et al., Quantification of pharmaceuticals, personal care products, and perfluoroalkyl substances in the marine sediments of Puget Sound, Washington, USA. Environmental Toxicology and Chemistry, 2013. 32(8): p. 1701-1710. Lubliner, B., M. Redding, and D. Ragsdale, Pharmaceuticals and Personal Care Products in Municipal Wastewater and Their Removal by Nutrient Treatment Technologies. Publication Number 10-03-004. 2010, Washington State Department of Ecology: Olympia, WA. Morace, J.L., Reconnaissance of contaminants in selected wastewater-treatment-plant effluent and stormwater runoff entering the Columbia River, Columbia River Basin, Washington and Oregon, 2008–10: USGS Scientific Investigations Report 2012–5068. 2012, U.S. Geological Survey: Reston, VA.
Peck, K.A., et al., Development of an enzyme-linked immunosorbent assay for quantifying vitellogenin in Pacific salmon and assessment of field exposure to environmental estrogens. Environmental Toxicology and Chemistry, 2011. 30(2): p. 477-486. Lower Columbia River Estuary Partnership, Lower Columbia River and Estuary Ecosystem Monitoring: Water Quality and Salmon Sampling Report. 2007. Johnson, L.L., et al., Xenoestrogen exposure and effects in English sole (Parophrys vetulus) from Puget Sound, WA. Aquatic Toxicology, 2008. 88(1): p. 29-38.
da Silva, D.A.M., et al., Endocrine disrupting chemicals in fish bile: A rapid method of analysis using English sole (Parophrys vetulus) from Puget Sound, WA, USA. Chemosphere, 2013. 92(11): p. 1550-1556. CDC, Fourth National Report on Human Exposure to Environmental Chemicals. 2009, Department of Health and Human Services. Center for Disease Control and Prevention: Atlanta, GA.